Just me, no make up, my comfy slippers, baggy jumper and Graham Norton on radio two. Recently instead of dreaming, I actually got the chance…… Not that it all went totally to plan of course! With a group of very lovely ladies due to arrive the next day (Sunday) for a gift wrapping class, it was a great excuse to live the dream and bake lots of goodies I could serve them on our break at the class. Like many, I have a signature cake that always turns out well and I know that whenever I bake it there’ll only be crumbs left of it the next day. For me that’s my mothers traditional chocolate cake recipe with real cadbury’s chocolate on top and buttercream icing in between. However, whilst I don’t bake often I do like to try my hand at something different every now and again. It’s that thrill you get when you do something new and it actually turns out really well. 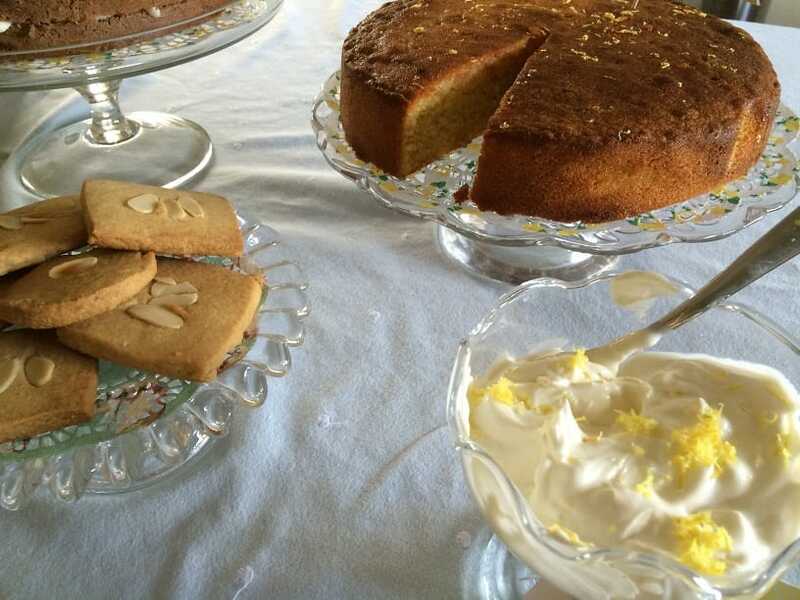 In this case it was Lemon, honey and polenta cake (served with creme fraiche mixed with lemon rind) and almond and honey biscuits. I found it (like you do) while just flicking through a magazine with no baking agenda and there it was…shouting ‘try me, try me’. So, decision made, the day before ‘baking day’ I checked my cupboards for ingredients I’d need and set off shopping for those I didn’t have. So Saturday morning it was like Christmas…Up early and all excited. I turned on the radio, donned a rather fab ‘Mrs Madden Makes’ Pinny, made a pot of tea and went to line the cake tins. So, baking paper…. Ah…Now…where could it be? I scrabbled through the drawer. Nope, not there. Had it gone to its hiding place down the back and into the cupboard perhaps? Nope. It seems the greaseproof paper fairy had been and borrowed it. So, only one thing to do….off I jumped in my car (well after taking off the slippers) and down to the nearest shop. Let me see….Baking paper, baking paper…..I scoured the shelves up and down but could you believe it, no paper!! So back in the car to the next shop a few miles away and voila…loads of it. So after purchasing two packs of it (for good measure), I headed back for home. Right pinny back on, hands washed ,..Off we go! Tins lined, time to weigh the plain flour for the biscuits…Plain Flour, yes I have plain flour I saw two packs of it yesterday …mmn but what’s this? One is near on empty and the other….well, the sell by date fairy has also visited and it appears I’m out by a year….What were the chances of that? (note to self… better stock rotation required!) Oh hey, back in the car I went…. Not even bothering to go to the most local shop this time in case it didn’t have any, I headed back to the shop furthest away again where once again, they came through for me and had mountains of it. On leaving with a large bag of flour the Shop assistant did one of those knowing nods …I smiled one of those knowing smiles and off I went. Once again, all sorted, back home, pinny on, hands washed ready to proceed and…. Phone rang. Door bell chimed. Dog needed walking (actually I don’t have a dog but if I had, it would have surely have needed a walk) It was bedlam . You have to smile don’t you. So, a little longer than expected, with more interruptions, delays, unstocked shops and bad fairies than I’d ever imagined, I did, in the end make it. (with the help of Graham Norton and a good shop). And it all turned out swimmingly too ….There’s nothing like the feeling of when you bake something new and its a hit with your guests. 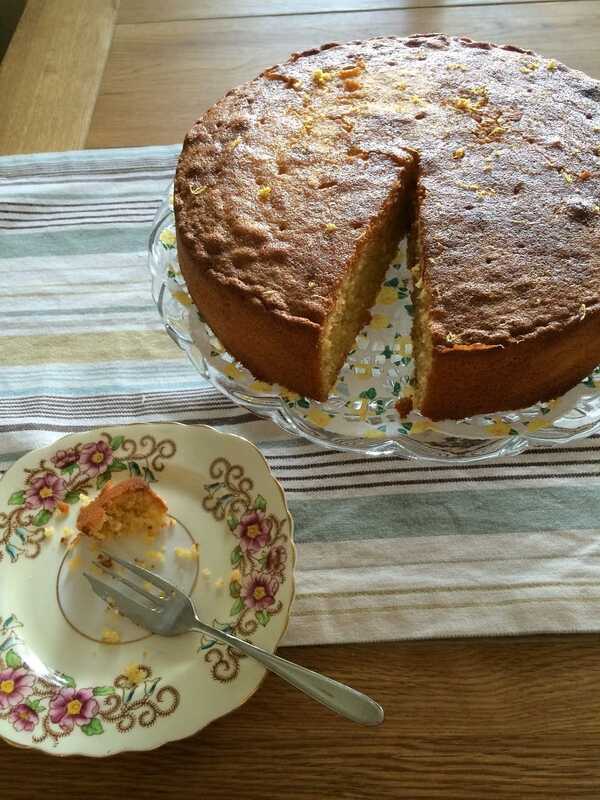 Thank you ladies…Lemon, honey and Polenta cake recipe on its way to you as promised!